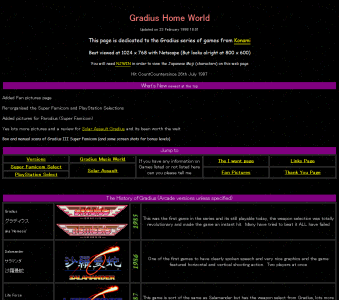 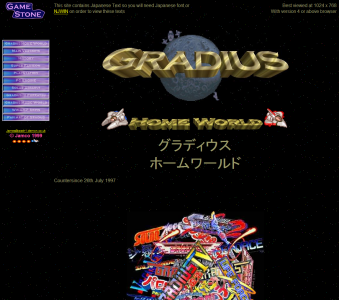 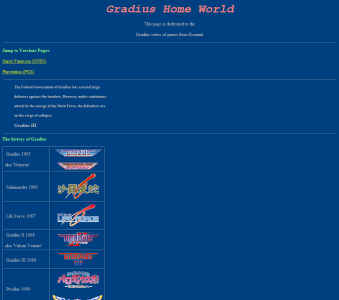 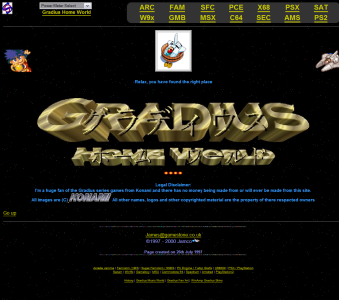 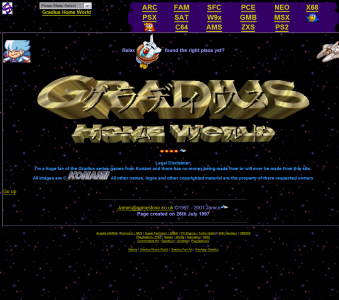 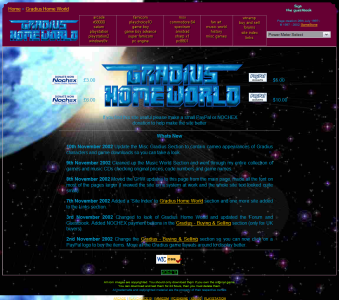 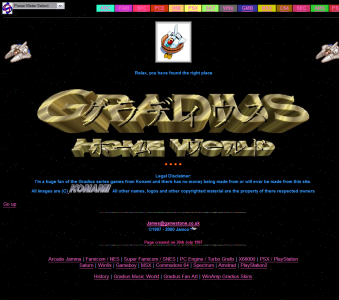 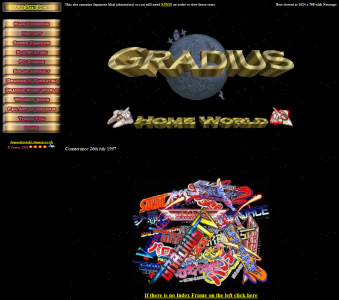 Gradius Home World was originally started because of a flatbed scanner I had just bought from a friend back in 1996, I scanned the PlayStation game 'Gradius Deluxe Pack' front and back covers and then I put together a simple html webpage using notepad. 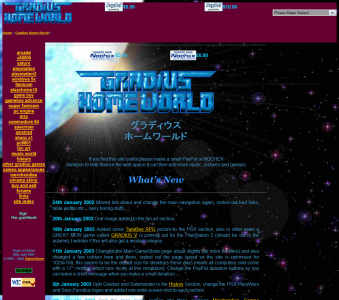 Notepad was rubbish so I quickly moved onto Adobe Page Mill 2 for just under two years - Here is the Oldest version I have of Gradius Home World from my archive. 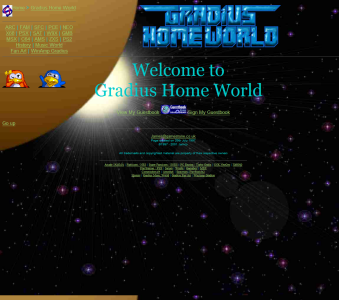 After a year or so I move onto Microsoft Frontpage 2000 which was much better (just) and expanded the site, but webspace was at a premium at the time (I only had 5meg!!) 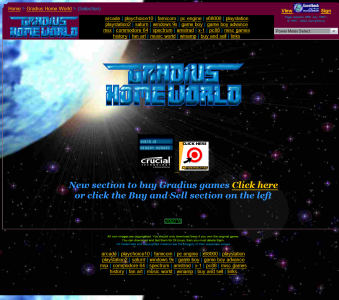 so the site contained no media at all. 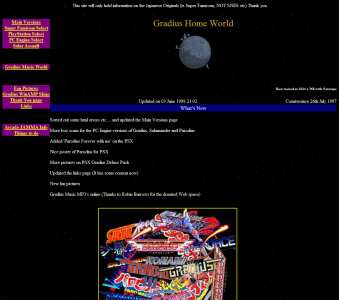 In the same year I read a review for Macromedia Dreamweaver 2 and after looking at a demo I bought a copy, that's when the site really got going and was much easier to update. 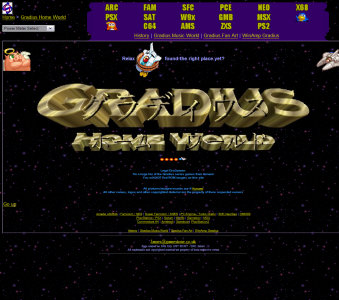 After registering the GameStone domain and moving the site to a new host (still my current host funny enough) things become much smoother with the new host supporting php and mysql, because of these two technology's I was able to add a guest book, poll and phpBB web forum, the guest book became obsolete as it just fill up with spam but afer a few months the forum took over for messages and chat. 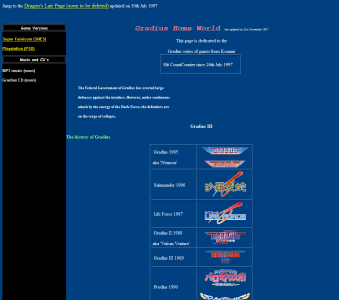 Fast forward a few years and I changed the forum to the excellent and expensive vBulletin, it now has quite a small active member list now. 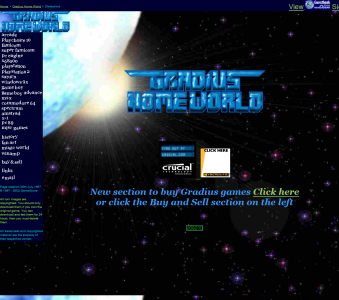 The site is maintained by me alone (GameStone), though the forum has two extra moderators and has become the most active section with the main site only seeing updates every now and again. 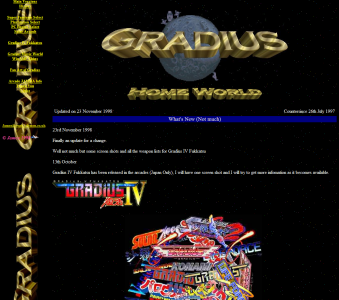 Well there's not much else to say so why don't you take a look of these screen shots of the site over the years to show how it's progressed.